Gaming Addiction: Is your teen spending too much time playing video games? Can a game truly become an addiction? Yes, according to the World Health Organization (WHO). In fact, there is a name for it: gaming disorder. 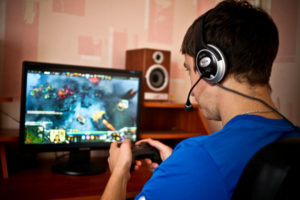 The WHO states that gaming disorder is defined: “as a pattern of gaming behavior (“digital-gaming” or “video-gaming”) characterized by impaired control over gaming, increasing priority given to gaming over other activities to the extent that gaming takes precedence over other interests and daily activities, and continuation or escalation of gaming despite the occurrence of negative consequences.” Essentially, there is a fine line between enjoying video games and overusing video games. There is a difference between gaming overuse and the actual disorder. However, parents can take steps to ensure their child is not becoming too reliant on technology in general. Go Screen Free. This is extreme, but also the easiest thing to do to encourage your child to partake in other activities. If it’s not available, your teen can’t play it! If you feel like your teen is overusing, try a screen detox for a month. Sure, you’ll probably be met with resistance at first, but you’re sure to see positive changes over time. Have Family Dinner. Getting together as a family at the end of every day to enjoy a meal is a great way to connect with each other, go over the highs and lows of the day, and relax. Make sure your kitchen table is a no screen zone. No TVs, iPads or smart phones allowed. Remove Smart Phones or Devices from the Bedroom. Children and teens need their sleep. Instill a policy at home to put all devices to charge overnight away from the bedroom. Limit Screen Time. Many studies suggest limiting video game use to 1 hour per day for children. This way, the children will still have ample time for normal socializing, physical activity, homework, etc. Encourage Healthy Activities and Lifestyle Choices. Cook together. Move more. Go outside and smell the roses. Joining clubs and sports teams is also a healthy way to spend time. Too much gaming can trigger the same types of symptoms as someone addicted to drugs or alcohol. It can lead to ADHD, anxiety, and even depression. As a parent, remember that YOU are in charge.